Ever wonder where your time goes? Modern life is busy, with multiple commitments every day. Work rarely seems confined to predictable hours, and free time isn’t very free. Shopping for groceries and other necessities, food preparation, errand running, taking care of your home and garden, and dealing with life’s little emergencies sometimes just can’t be accomplished within the limited time (and energy) you have available. That’s when you need a helping hand from Alyssa’s Simple Solutions. 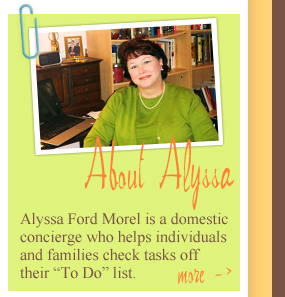 Alyssa Ford Morel is a domestic concierge who helps individuals and families check tasks off their “To Do” list. Whether the task has been a long-term problem or a recent issue that has just arisen, Alyssa will serve as your friendly, energetic and organized personal assistant, just a phone call away. You can hand over your list of household needs, knowing that she will listen to your wishes and accomplish them correctly and efficiently. You’ll be amazed at how simple it is and how much more time you have. Not quite sure about using Alyssa’s Simple Solutions? Just contact Alyssa by phone at 703/907-9318 or by email for a complimentary, no-obligation consultation to discuss your needs and goals. Alyssa’s Simple Solutions serves Arlington County in Northern Virginia and its surrounding communities.